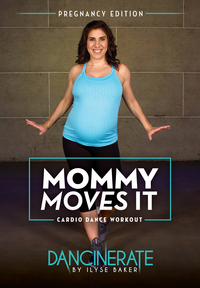 This 18 min workout is available on digital download as part of Ilyse's Pregnancy Edition workouts. You wont need any equipment for this disco inspired dance cardio workout. Ilyse works out alone against a gray brick wall. Ilyse shows each move 4-5 times, then adds it to the previous exercises, building 2 mini dance routines. After a built in warm, moves step cross back, grapevine, raise the roof, hip shakes, disco point, circle walk, squat & kegals, and concludes with a stretch.